When I first moved to Chicago, I created my gmail account under “Whitney in Chicago” because it was just felt like such a change for a Texan like me moving up to the cold Midwest. It was only logical that I would name my blog the same thing. Although I will forever remain a Texan at heart (Texas Pride is indoctrinated early on in elementary education-Yellow Rose anyone? ), I have enjoyed making Chicago my new home. However, this means that I must make my own Tex-Mex favorites at home (and fill suitcases to the weight maximum with good salsa). Tortilla Soup might not be strictly “Tex-Mex” per se, but it was always one of my favorite things to order at Pappasitos when I wanted a light lunch and I can’t remember the last time that I had a satisfying bowl. Thankfully, Hannah reminded me last week about what I was missing and I immediately knew which soup recipe was next on my list. Like most soups, this recipe comes together pretty easily, especially if you have some leftover roast chicken to use up. Unfortunately, I didn’t, but I went to the store and bought a whole chicken (because it’s the cheapest) and cut it up into pieces, saving the back and the bones for my stock pot. While the chicken pieces were roasting in the oven with a little S&P, I sauteed a chopped onion, some jalapeno and garlic until they were brown and tender then threw in a can of Muir Glen fire-roasted tomatoes, a cup of corn, some spices and some homemade chicken broth. While the pot was simmering on the stove, I made some freshly fried tortilla strips and grated a block of Monterey jack. 30 minutes later, I had a bowl that tasted like Texas. It is best to use somewhat dried out corn tortillas so if you have some that have been around a little while, awesome, but if not, stick them on a baking sheet in the oven at 200°F for 10 minutes to dry them out a bit. 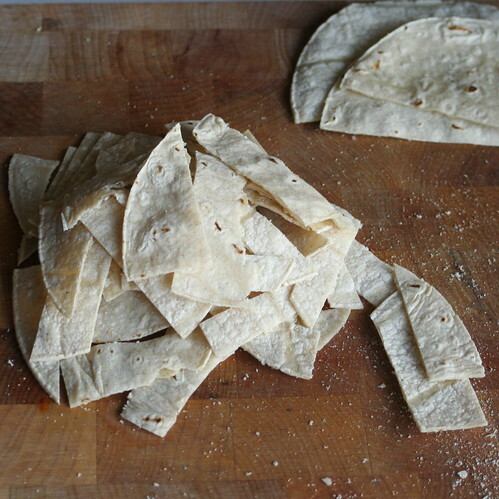 Cut tortillas in half and then cut halves into 1/4-inch strips. In medium saucepan, heat oil over medium-high heat. Fry strips in oil, 1/3 at a time, until light brown and crisp. Make sure not to leave the pot while you are doing this. They turn from uncooked to light brown pretty quickly (I made an overdone batch-don’t make my mistake). Remove from pan; drain on paper towels. Save for later. Heat a glug of olive oil in a dutch oven over medium heat. Cook onion in oil 3-4 minutes, stirring occasionally. Add garlic and jalapenos and cook 2 to 3 minutes, stirring frequently. Add cumin and chipotle peppers and cook 1 more minute. Stir in broth, tomatoes and salt. Bring to a boil and then reduce heat to medium; cover and simmer 15 minutes. Add shredded chicken and a handful of diced cilantro; heat until hot. Slice the avocado in half. Slice into 1-inch slices. If you aren’t using the whole thing, leave the pit in the half and wrap in plastic wrap and store in the fridge to prevent browning. 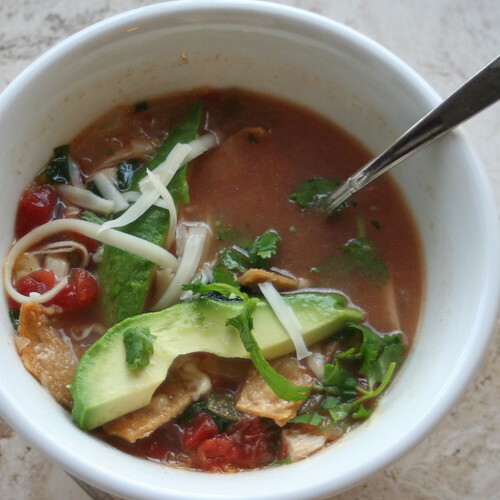 Ladle soup into bowls and top with tortilla strips, avocado, grated cheese and a sprinkle of cilantro. If you have the lime, serve with a wedge to squeeze on top. Enjoy! This entry was posted in Chicken, Dinner, Mexican, Recipe, Soup and tagged Chicken, Recipe, Soup, Tex-Mex, Texas, Tortilla. Bookmark the permalink. This looks amazing!! I am making it as soon as I can! 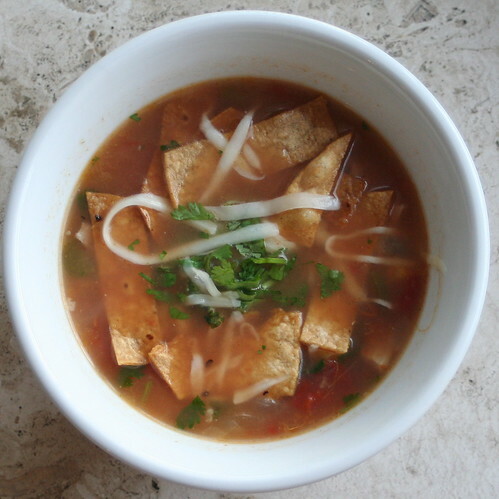 Mmmm…LOVE tortilla soup. Especially this time of year, its so warming. You’ve just given me a craving m’dear! Just home from the marathon and soup sounds just perfect to finish a cold Chicago day! Oooo that reminds me of the chicken-tortilla-avocado soup I made last year! I love those flavors. They’re just always good. Always. p.s. I miss you! Stupid business school eating up my entire stupid life. We should grab lunch sometime soon – I don’t have class Mondays or Fridays! Anyway, this looks really delicious and I will have to make it asap! Along with some homemade tortillas! PS – love that you are writing for the Chicagoist now. What a great peek into the Chicago blogging scene! Andrea-I hope you try it; really yummy. Jenn-Tastespotting is a fickle creature but it was nice to get this post on. Wiggs-very similar to your soup; lunch soon! Man – I’m not from Texas, but I do love some ‘tex-mex’ food!! This looks just plain delish! Hey! I stumbled across your blog from Eating Bender. I am also a former Texan who recently made my home in Chicago! I miss the fabulous mexican food back “home,” too!! 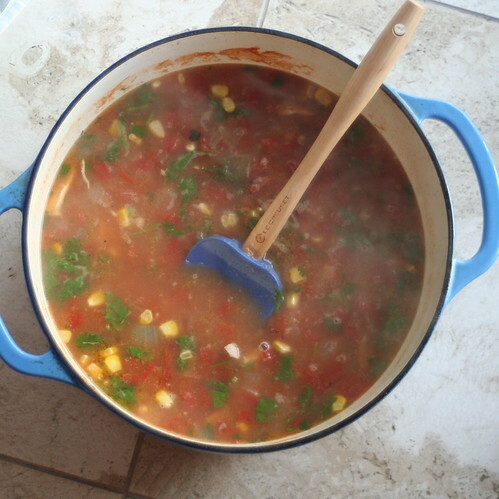 I asked my friend for her amazing tortilla soup recipe and she sent this link to your blog – soup is great. Thanks!